I cooked dinner last night, just the second time since the arrival of my parents! 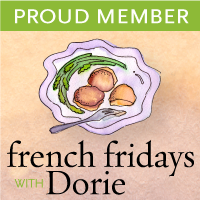 I hope to share some of my mum’s cooking with you in time. 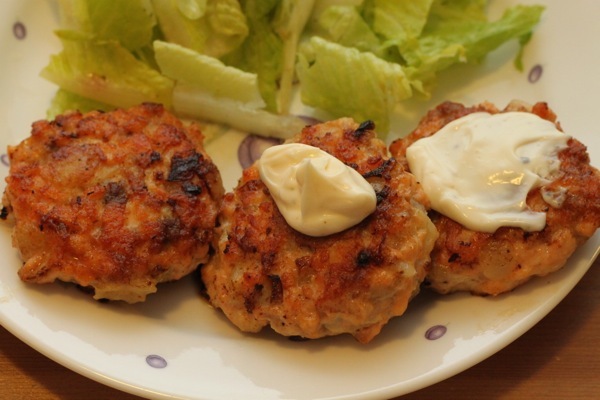 This salmon burger is easy to put together and cooks quick too. 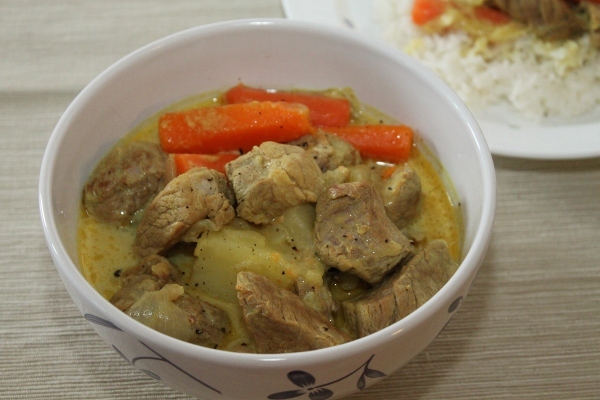 It uses fresh salmon and ground pork with potatoes and onions for extra bite. I make it with leftover grilled salmon too. My family likes these burgers including hubby who is not a fish fan. Hope you’ll like them too! 1. 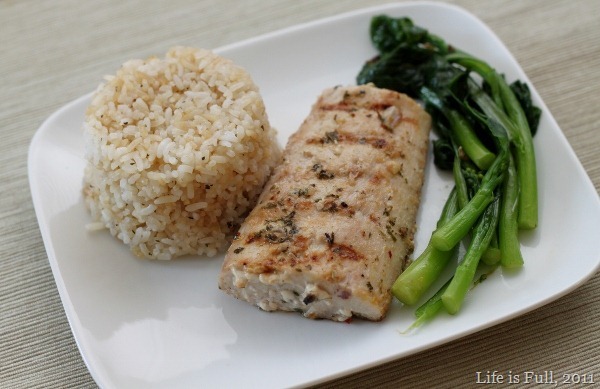 Chop salmon finely until it is almost ground. 2. Lightly cook chopped onions in the butter, taking care to retain the onion’s crisp texture. Leave to cool. 3. Boil the potato or microwave it till cooked. 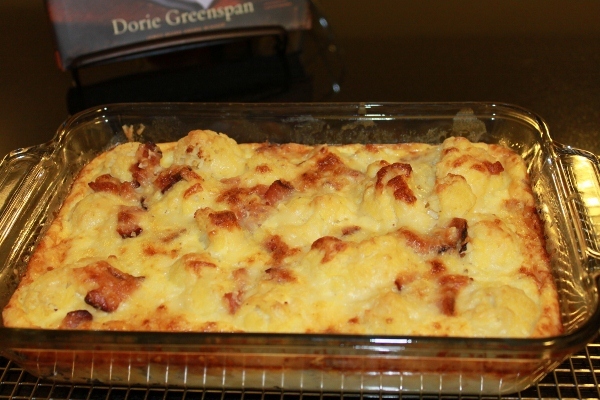 Mash and leave to cool (do not add any butter or milk). 4. In a large bowl, mix the chopped salmon and ground pork. Add the cooked onion, mashed potato and beaten egg, then season with salt and pepper. 5. Shape the mixture into small burgers. Heat some oil in a frying pan. Working in batches, fry the burgers for 2-3 minutes on each side till browned and the meat is cooked. 6. Serve with Ponzu sauce (or mix light soy sauce with lemon juice) or mayonnaise with coarsely ground black pepper. Tonight’s dinner was one of those ‘use whatever you have’ dishes. Hubby wanted noodles for dinner and I had half a packet of dried brown rice vermicelli (‘mei fun’ in Cantonese) in the pantry. 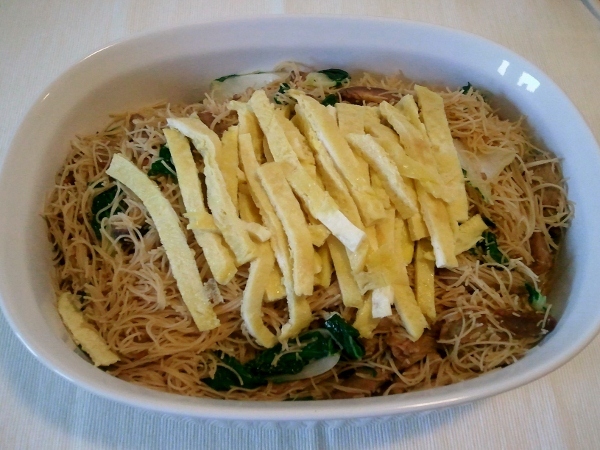 Rice vermicelli is usually fried with meat (pork), shrimps and greens. I had some BBQ pork in the freezer, dried mushroom and some baby bok choy so it’s perfect. 2 tbsp BBQ pork drippings/juice (ask from the BBQ pork butcher, the meat is usually in a pan with the juices). 2. Wash and cut bok choy into section. Fry with 1 tbsp of oil till softened. Remove from pan and set aside. Fry BBQ pork till fragrant and heated through, remove. If using raw pork and shrimps, fry till cooked and remove. 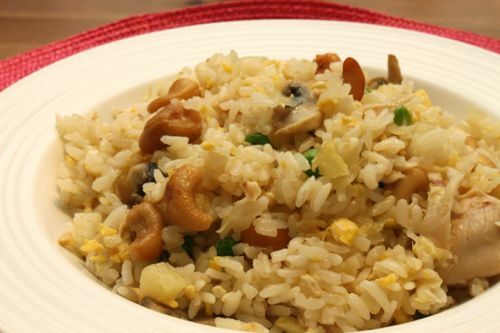 Fry mushrooms and shallot till fragrant. Drizzle over the dark soy sauce, mix, then add in the seasoning. Bring to a boil. Bring heat to medium. 3. Add in the rice vermicelli and toss well. Add the bok choy and cover for 1 minute. Remove the cover and toss to combine all the ingredients and to make sure the noodles is evenly covered with the seasoning. 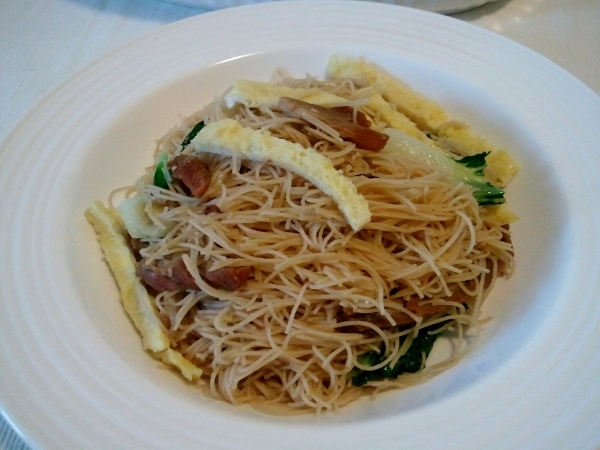 Toss until the the vermicelli is fairly dry. Add in the pork and toss again to combine. Taste and add more light soy sauce if needed. Dish out and scatter the shredded omelette on top. Enjoy! Tomorrow is Big Kid’s birthday. He saw the Perfect Party Cake in my Baking book and liked it. That boy likes fruit and jam so I know he was attracted to the red jam filling between the cake layers. I know many who baked this cake had problems with the cake not rising. I read all the tips but alas, my cake failed too. Maybe it was the dark pans, maybe it was the lower heat I used (since I was baking with dark pans), maybe I overbeat or underbeat the batter but whatever it was, my cake did not rise. They were barely an inch tall. I would not be able to recreate the tall four-layer cake from the book. It was disappointing. After some consideration, I just decided to cut my losses and abandon the project. Don’t shout at me. It’s already too late. I have placed an order for a cake from a bakery. A lemon mousse cake because my boy likes tart desserts too. I felt sad because I’ve always baked birthday cakes for my family unless there was a specific request for something else. I didn’t have the mood to make dinner but we got to eat. I took the 4 egg yolks left over from the cake recipe and made comfort food – pasta with carbonara sauce. 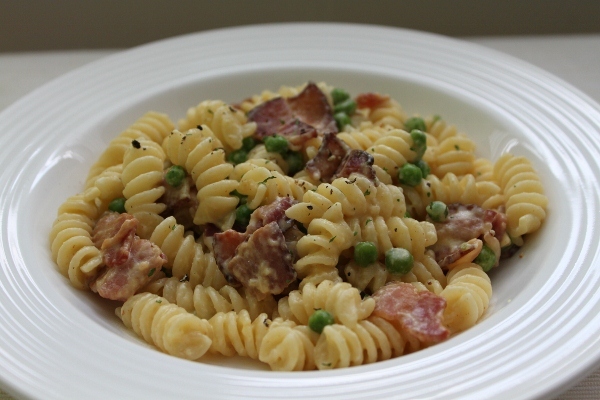 We had rotini carbonara with bacon, peas and garlic. Yum. I feel slightly better. Boiled pasta till al dente. Meanwhile, put sliced bacon into a cold saucepan and cook over medium heat, stirring occasionally, under bacon is crispy. Pour oil away leaving a teaspoon and stir in minced garlic and some frozen peas. Cook till garlic is fragrant and peas are heated through. Remove from heat. In a medium bowl, whisk together egg yolks, 1/2 cup half-and-half, 1/2 cup finely grated Parmesan, salt and pepper. When pasta is done, drain pasta and pour it back to the pot. Toss the egg mixture through the hot pasta then toss with the bacon mixture. Serve immediately. I bought a bag of Mahi-Mahi chunks from Costco. It’s a fish with firm flesh, the type preferred by my fish-averse husband! It’s convenient to have a bag of frozen fish in the freezer for the days when you don’t want to spend a lot of time preparing dinner. I have pan fried the mahi-mahi before but now that it’s summer I chose to grill it yesterday. Then feeling that serving it with plain white rice is well, plain, I made garlic rice with the cooked rice. Really quick and simple too. Boiled some greens and I have a balanced meal. Place the fish in a baking tray. 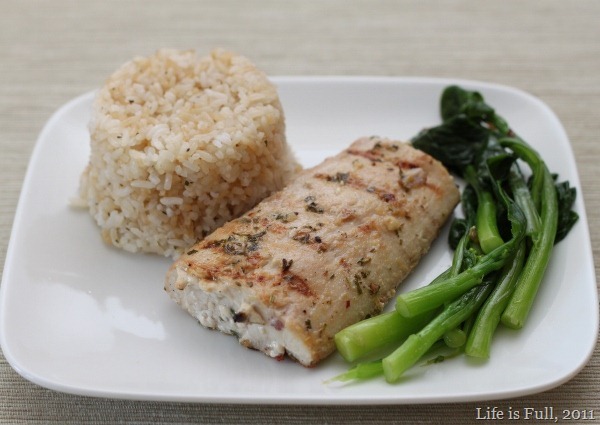 Mix the other ingredients in a bowl and pour over the fish to marinade for an hour. Turn the fish over halfway. Heat the grill and rub some oil on the grill. Grill the fish over direct medium heat for 3-4 minutes each side. Serve. Heat the oil in a wok and fry the garlic until you can smell it. Then add the rice and the stock granules. Drizzle soy sauce around the rice on the inside surface of the pan. Add in the basil and mix. 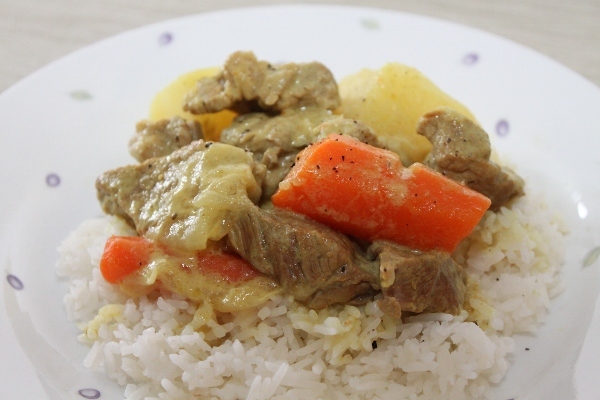 Turn off the heat and stir until the rice is evenly mixed.